Gordon Miller: [pulls newspaper down] Well, what do you want? Can't a man have a little privacy around here? Sasha: The check, Mr. Miller. Gordon Miller: Oh, the check... Is this check any good? Sasha: Why, uh... yes, sir. Gordon Miller: Well, we'll soon find out. There you are. Gordon Miller: Don't give me any of that 'thank you' stuff. Sasha: Mr. Miller, many times I have seen your company rehearsing on the 19th floor. Please, I would like to play the part of the Polish miner. OK, but not great, Marx Brothers movie. Started off well enough. Set up was good, some good one-liners from Groucho and was quite coherent. Middle section had some great sight gags (anything involving the turkey, and Harpo being diagnosed by the doctor, especially). However, from a point it lost coherence and just got silly. Not ridiculously, unwatchably silly, but just mundane and not too funny. 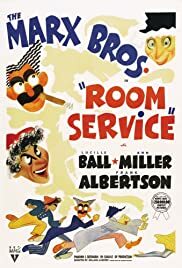 Overall, the jokes were weaker than their best, and even Groucho's famous wisecracks seemed weaker and fewer-and-further-between. Performances, given the material, are OK though. Lucille Ball is great in a supporting role, and not just for her acting... Good support too from Ann Miller and Frank Albertson. Certainly not in the same league as A Night At The Opera, but reasonably entertaining nevertheless.